Another Feather in Our Cap: Message Systems makes the 2014 Email Integrity Honor Roll! Blog Email Infrastructure Authentication Another Feather in Our Cap: Message Systems makes the 2014 Email Integrity Honor Roll! Message Systems is pleased to announce today that we have qualified for the Online Trust Alliance’s 2014 Email Integrity Honor Roll. The audit evaluates a company’s adoption of email authentication practices and focuses in particular on email authentication that helps detect and block spoofed and forged email such as Sender Policy Framework (SPF), DomainKeys Identified Mail (DKIM) and Domain-based Message Authentication, Reporting & Conformance (DMARC) practices. As part of this audit, the Online Trust Alliance reviewed over 800 companies and brands, out of which only 12% passed, and Message Systems is honored to make the list! From the positive effects we’re seeing across the industry, it’s clear that DMARC is succeeding as intended in deterring malicious email attacks – which is great news. Message Systems will continue to provide the technologies our customers need to quickly implement SPF, DKIM and DMARC to protect their brands and customers. Earlier this year, we also qualified for the Online Trust Alliance’s 2014 Online Trust Audit and Honor Roll – this latest honor further recognizes our commitment to educating the industry on email security for online brand protection through leading by example. Adoption of SPF and DKIM is rising across all the industries. The Internet Retailer 100 had an 88% adoption rate, while the Internet Retailer 500 had the largest growth, rising from 56% to 74% adoption. Adoption of DMARC is increasing slowly but steadily, and the top social sites had the highest score for DMARC adoption at 36%. Among the list of companies that made the 2014 Email Integrity Honor Roll, many were our customers and partners, and we’d like to offer everyone a hearty congratulations! DMARC allowed us to dramatically reduce the number of forged emails sent to our users. DMARC was a direct benefit to our users by blocking these impersonations. SPF and DKIM are vitally important for email senders to implement today, but they are merely table stakes in an escalating battle against email fraud. DMARC is a powerful solution empowering senders who are prone to brand infringement and malicious attacks. Of all the consumer domains sampled, only 8.3% have implemented SPF, DKIM and DMARC. Brands are failing to authenticate at top level domains; SPF and DKIM adoption only grew at the level of sub domains, thus leading to limited brand and consumer protection. While DMARC adoption is growing, it still remains low. Top FDIC insured banks had the highest failure rate compared to all sectors due to a lack of email authentication – only 17% passed the audit. 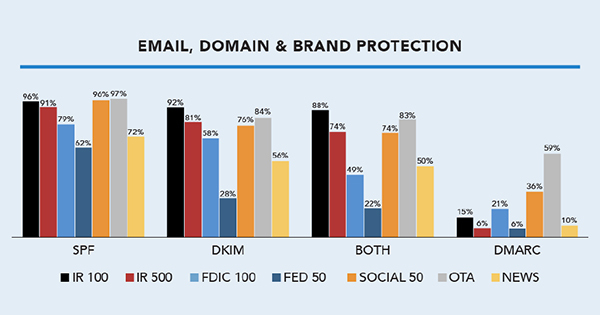 The top 50 federal government sites consistently scored at the bottom of all email authentication metrics – only 4% passed the audit. The report points to the inconsistency of email authentication in organizations due to email marketing being outsourced to disparate third party systems. We’d like to point out that our email infrastructure platform, Momentum, (available in on-premise and managed cloud versions) fully supports both inbound and outbound email authentication – one of the many reasons why the world’s largest senders choose us to send 20% of global legitimate email through Momentum. Finally, we’d like to end with a note of caution from the audit report: a lack of email authentication exposes businesses to the risk of liability and class action suits in the event of a data breach. If you’re interested to find out whether your email service provider is authenticating your mail, test it with our email Validator – it checks for DKIM, SPF and DMARC email authentication.